Chang, W. et al. (2016) Proc. Natl. Acad. Sci. U.S.A. 113, E5491. Merkel discs, tactile end organs, are highly specialized structures in the periphery of mammals. They play an important role in environmental exploration and social interaction. The Merkel disc is abundantly expressed in finger tips, whisker hair follicles and other touch-sensitive areas. The presented work sheds light on the controversial synaptic aspects of Merkel discs and identifies ionotropic and metabotropic 5-HT receptors as important and critical players in relaying those synapses. Immunohistochemical staining of mouse trigeminal ganglion (TG) sections using Alomone Labs Anti-5HT2A Receptor (HTR2A) (extracellular) Antibody (#ASR-033), Anti-5HT2B Receptor (HTR2B) (extracellular) Antibody (#ASR-035) and Anti-5HT3A Receptor (HTR3A) Antibody (#ASR-031) shows that all three receptors are expressed in retrogradely labeled whisker afferent neurons (Figure 1). Together with sisyphic electrophysiological experiments, data show that Merkel cells in mouse whisker hair follicles are mechanical transducers which trigger serotonin release upon stimulation. The excitatory actions of the serotonin released is mediated by both metabotropic and ionotropic 5-HT receptors expressed at whisker afferent endings innervating Merkel disks in whisker hair follicles. Important questions arising from this study include the possible role of serotonergic transmission under pathological conditions in patients with diabetes, tissue inflammation. Figure 1. Expression of metabotropic and ionotropic 5-HT Receptors in mouse trigeminal ganglion.Immunohistochemical staining of mouse trigeminal ganglion (TG) sections using Alomone Labs Anti-5HT2A Receptor (HTR2A) (extracellular) Antibody (#ASR-033), Anti-5HT2B Receptor (HTR2B) (extracellular) Antibody (#ASR-035) and Anti-5HT3A Receptor (HTR3A) Antibody (#ASR-031) (red) shows that all three receptors are expressed in retrogradely labeled whisker afferent neurons.Adapted from Chang, W. et al. (2016) with permission of the National Academy of Sciences, USA. Philippart, F. et al. (2016) J. Neurosci. 36, 7234. Spontaneous L-type currents in Dopaminergic (DA) neurons from the substantia nigra compacta (SNc) are larger than those from the ventral tegmental area (VTA). These currents are believed to be important for maintaining dopamine levels in target areas. Dopamine neurons from SNc are also significantly affected in Parkinson ’s disease. The cause is assumed to be increased Ca2+ load in DA neurons. Immunohistochemical staining of rat brain sections using Anti-CaV1.2 (CACNA1C) Antibody (#ACC-003) or Anti-CaV1.3 (CACNA1D) Antibody (#ACC-005), shows that CaV1.3 channel is detected in SNc and VTA regions while little or no CaV1.2 is expressed (Figure 1). The authors suggest that the difference in spontaneous firing between SNc and VTA may be due to differences in auxiliary subunit expression and not in CaV1.3 expression per se. Figure 1. 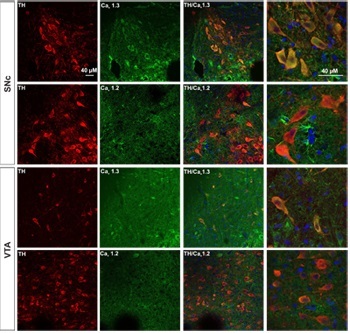 Expression of CaV1.3 in DA neurons from SNc and VTA.Immunohistochemical staining of rat brain sections using Anti-CaV1.2 (CACNA1C) Antibody (#ACC-003) or Anti-CaV1.3 (CACNA1D) Antibody (#ACC-005), shows that CaV1.3 channel (green) is detected in SNc and VTA regions while little or no CaV1.2 is expressed. CaV1.3 co-localizes with TH (red) in the soma as well as in the proximal dendrites of SNc and VTA DA neurons.Adapted from Philippart, F. et al. with permission of the Society for Neuroscience. Zaika, O. et al. (2016) Am. J. Physiol. 310, F311. The role of insulin and insulin-like growth factor-1 on Kir4.1 and Kir5.1 K+ channels in kidney cortical collecting duct (CCD) was investigated. 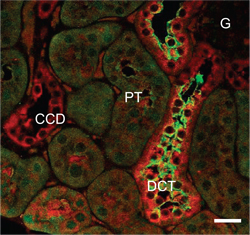 Both channels are major contributors of K+ currents on the basolateral side of principal cells of CCD. Both hormones were shown to activate the channels in a PI3K-dependent manner. Kir4.1 channel expression (Figure 1) in the kidney was validated by immunohistochemical staining of mouse kidney sections using Anti-Kir4.1 (KCNJ10) Antibody (#APC-035). Kir4.1 staining (red) is localized to the distal convoluted tubes and co-localizes with NCC (Sodium-Chloride co-transporter), (green). The study suggests that blocking Kir4.1/5.1 channels may be beneficial in cases where insulin levels are high, such as diabetes. Expression of Kir4.1 in mouse kidney.Immunohistochemical staining of mouse kidney sections using Anti-Kir4.1 (KCNJ10) Antibody (#APC-035). Kir4.1 staining (red) is localized to the distal convoluted tubes and co-localizes with NCC (sodium-chloride co-transporter), (green).Adapted from Zaika, O. et al. (2016) with permission of the American Physiological Society.